Since the disbandment of his Navicon Torture Technologies (NTT) project in around 2010, Lee Bartow (aka Theologian Prime) has spent the last few years building the profile of his new project Theologian. So, to quickly reflect on NTT’s legacy, Lee demonstrated a hyper productivity to his output by issuing 60 NTT releases in the years between 1997 and 2010. This work ethic has then translated over into Theologian where he has outdone himself even by his own standards; having issued a massive 45 releases since 2010. With many of these releases being collaborations or live material, ‘Pain of the Saints’ is the latest ‘official’ album, where the presented material spans two discs and in excess 2.5 hours of music. Interestingly on the thematic front Lee has moved away from internalised topics of personal anguish and catharsis, towards an externalised analysis of the hypocrisy of the church, including matters relating to martyrdom and later sainthood. By now Lee has undoubtedly established a recognisable approach which draws from death industrial, dark ambient, (industrialised) noise and doom drone spheres; where these elements are combined with a particular ‘sonically overloaded’ and weighty approach, meaning from the opening moments this feels and sounds very much like Theologian. As such massive slow pounding rhythmic loops often provide the structural backbone, whilst multiple synth drones and layered sub-orchestral elements are then bedded down over an extended length (the longest track sits at excess of 13 minutes). Vocals also range from an anguished wail to partially sung, but are rendered indecipherable with shredding distortion or elongated drone treatment which coagulate within the sonic mass. CD1 (subtitled ‘piss’) contains a wide range of sonic styles where the opening cut ‘Savages’ acts as a sort of microcosm of this layered multi-directional approach. Here the cyclic layered shimmering drones, sweeping sub-orchestral layers and rolling militant percussion set the scene, before looped mechanized elements take hold and settles into a lengthy 10 minute industrialised groove. ‘Infection’ then presents sustained drones and thundering militant rhythmic chaos and although the following ‘Serpentine Angels’ commences in rather serene fashion soon enough the stoic industrial pounded beat and shredded vocals reappear. Ultimately some respite is found in the shimmering laid back spectral sub-orchestral sound of ‘Gravity’ which is a revelation and standout of a track based on its moody cinematic ebb and flow. For the later half of the first CD it continues the established pattern of looped and rhythmically / percussively driven offerings, where vague melodic elements are buried within the vast wide-screen structures. For the final track of CD1, ‘Sainthood is Suffering’ comes across as a rather divergent piece due to its throbbing, almost dancefloor oriented industrial beats. Although an interesting track it however feels slightly out of place and more like a ‘tacked on’ remix than a proper album track. CD2 (subtitled ‘jism’) continues the journey by showcasing more monolithic tonal blocks of sound, where aside from the vast rhythmic/ percussive structures of the opener (‘The Lies Of The Past Become The Prayers Of The Future’), the tracks are generally more subdued and cinematic, including an elongated compositional style for hypnotic effect. ‘Suppuration’ is a piece which works particularly well in blending the moody synth drones, scarred vocalisations and more abrasive rhythmic elements (being the inverse of many other compositions as the heavier elements gradually drop away to reveal the serene drones). ‘Their Gelded and Rapacious Hearts’ follows a similar path where its maudlin synth driven tone remains the focus throughout its 10 minute expanse, whilst ‘Blessed Prey’ also stands out due to its prominent violin motif within the sweeping ambient drone framework. ‘Redemption Is An Impossibility’ presents a slight deviation with its use of thrummed bass guitar and rolling drum kit percussion that edges the peice towards more chaotic realms. Much like CD1, the second disc is concluded with a rather sonically divergent track; here ‘Self-Flagellation as Faith’ is a dark synth driven rock song (complete with kit drumming) and comes across very much like that of Jarboe era SWANS due to the crooning female vocals (…an excellent concluding moment). 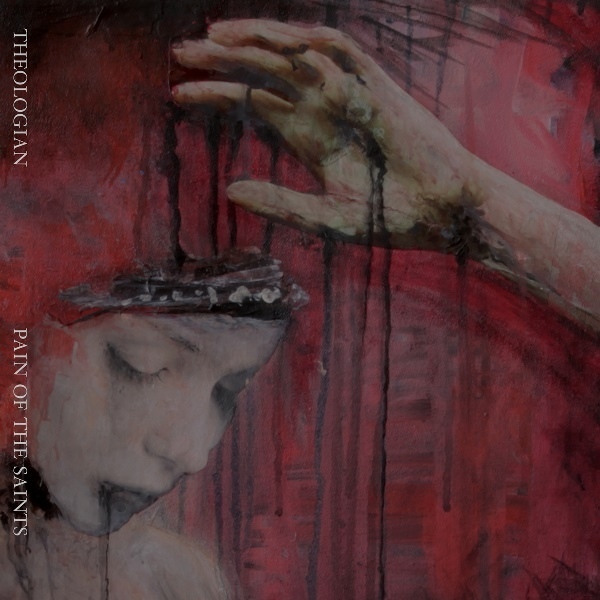 ‘Pain of the Saints’ clearly succeeds in its presentation of a strong and varied collection of tracks which demonstrates the focused and high calibre output of Theologian. Despite its extended length the album is not bogged down by superfluous content, although with the sheer volume of material here it is a takes a certain focused resolve to listen to this album in full given it warrants full emersion and not sporadic ‘cherry-picked’ listening. Rounding out the release is an oversized 8 panel digi-pack with beautiful cover painting and slick graphic design care of Lee himself. If you haven’t kept up with the hyper-productive output of recent years, this would be a perfect place recommence your appreciation of Theologian’s cinematically rendered yet resolutely industrialised sonic world. This entry was posted in 2015, dark ambient, death industrial, drone, heavy electronics, industrial, Malignant Records, power electronics by noisereceptor. Bookmark the permalink.